Noticed some play in drivers side wheel. bearings are ok. Pulled steering boot of and found the ball joint has about 1mm of play in it. The passenger side has no play at all. It looks like a sealed joint, so what exactly needs replaced? 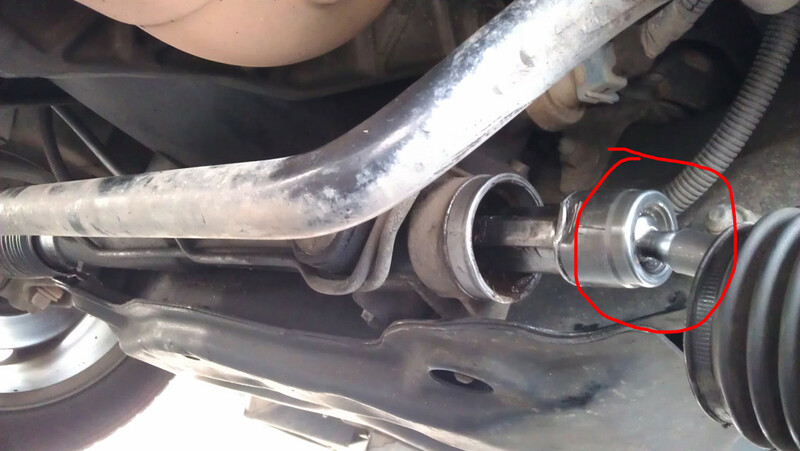 that joint can be replaced, some places call that the inner tie rod..
Ahhh great, thanks guys! Appreciate the replies! Depends how tight they are - those flats aren't very big. I modded an open ended spanner for mine - the real tight ones I used a set of vice grips, and filed/cleaned up the dags after retightening up. I get mine from these guys http://www.ebay.com.au/itm/Ford-Falcon- ... 58904cf30f pick them up when I go to Sydney. Just wondering how much play is too much in the joint that "the scotsman" marked up in red? Mine has a little bit of play, but not much. I know the inner tie rod ends are quite cheap, but the alignment is an extra $60 and I had one done not long ago so I rather leave it for as long as possible. The joint does not look like a part that could fail completely and suddenly?